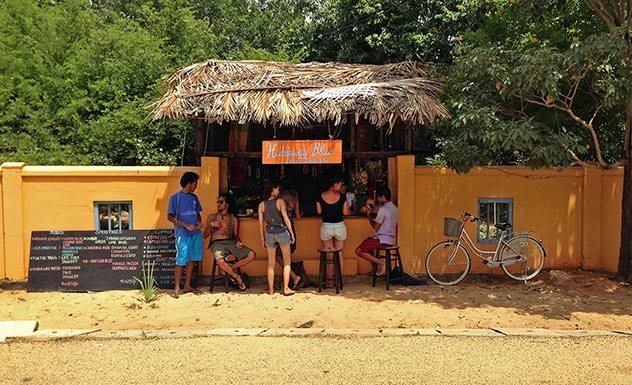 Set just across the road from the main surfing beach, Hideaway is a boutique guesthouse in Arugam Bay that was formerly a beloved holiday home. It still has a homely atmosphere and Sharon, the owner, runs it with a holistic approach. 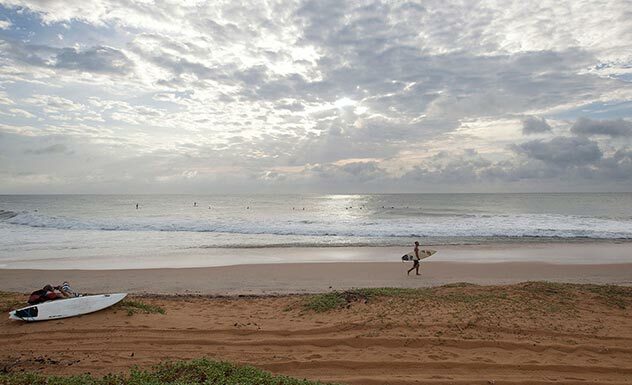 Sustainability and conservation are undoubtedly part of their ethos: aside from cultivating their own organic produce and establishing a water-bottle refill policy, they also launched the ‘Arugam Bay Beach Clean-Up Scheme’. Hideaway consists of 14 rooms altogether: 5 in the Main Villa, 6 Double Bungalows, 2 Garden Bungalows and one Family Bungalow. 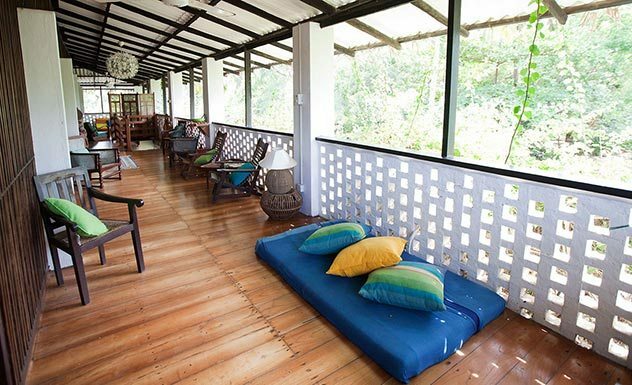 The main villa sits amongst wonderful tropical gardens, resembling a wildlife bungalow in a juxtaposing beach setting, with open verandas on both storeys. As well as the five rooms on the upper floor, there is also a living and dining area on the ground floor, furnished with comfortable chairs and cushioned ledges, and a garden complete with flowerbeds and a vegetable patch. There are also six whitewashed, thatched-roofed cabanas which offer more privacy including a bungalow designed especially for families with small children. Four double rooms and one triple room, all equipped with ensuite bathrooms with h/w and mosquito nets. 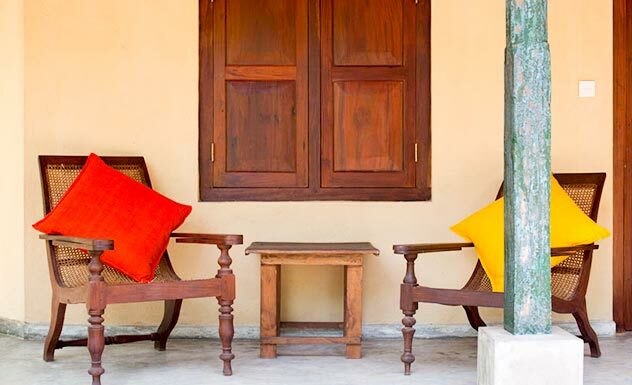 The rooms encapsulate a sense of traditional Sri Lankan living, with the fresh sea breeze and fans used to cool the room. The chic veranda is a tranquil spot, thanks to its bird’s eye view of the vivid garden below. 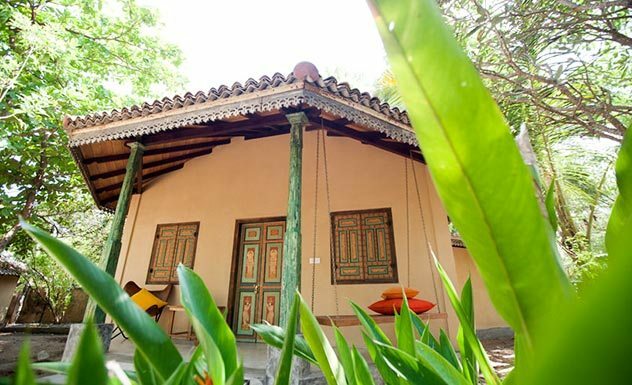 The Garden Bungalows are whitewashed cabanas with beautifully thatched roofs made from coconut leaves, again encompassing a very Sri Lankan tradition. 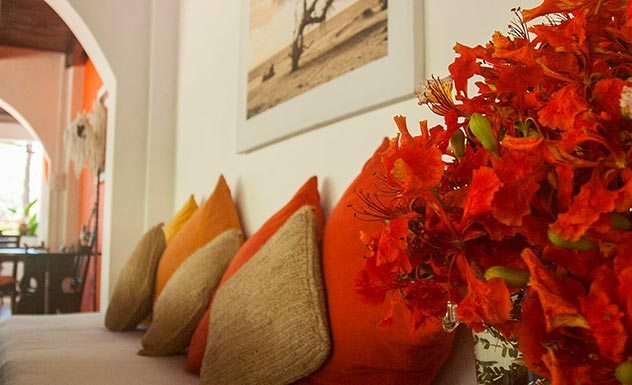 Each bungalow features an attached bathroom, double bed with mosquito net, ceiling fan and private veranda, and is decorated with bright splashes of colour such as flowers and bright cushions. There are four Double Bungalows, each furnished with a double bed and fitted with an ensuite bathroom. There are also outdoor showers with privacy screens. Wind down after a day of tropical beach fun on the private veranda or in one of the many hammocks hung up in-between the shady trees. Perfect for you and your significant other. 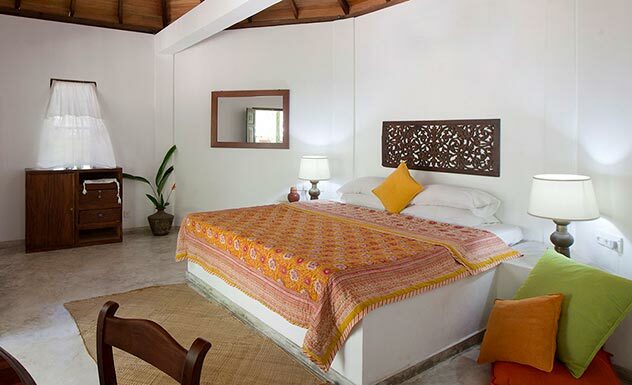 These are the only two rooms at Hideaway with air-conditioning (apart from the Family Bungalow). They offer stupendous views of the Indian Ocean. 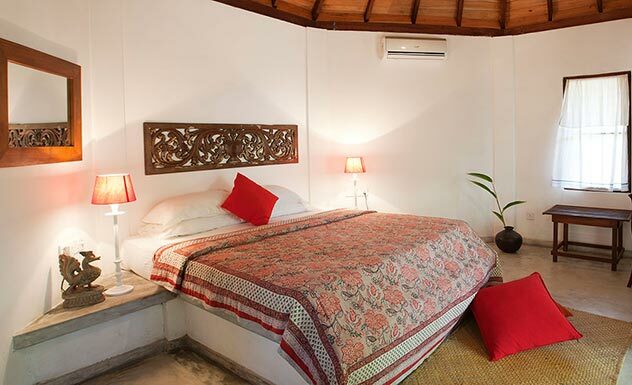 With one large king bed, two twin beds and air-conditioning, this bungalow is the perfect refuge for a family of 3-4. This spacious bungalow also has an ensuite bathroom, mosquito netting, ceiling fans, lounge chairs and a hammock. 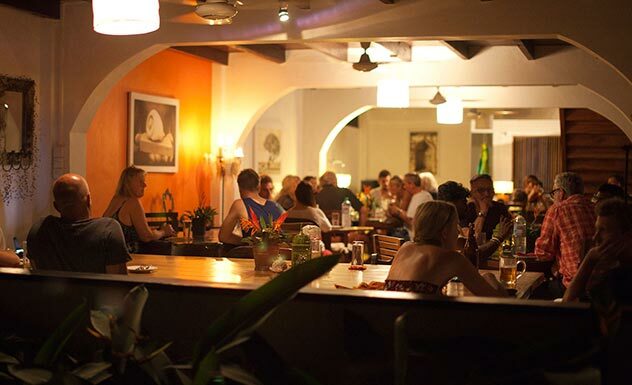 Hideaway’s mouth-watering cuisine is renowned throughout the island. The guesthouse is equipped with: Hideaway Blue, a café serving fresh juices, coffee and snacks throughout the day; a restaurant with a focus on healthy eating, which offers five new specials each day as well as a range of delicious dishes from around the globe; the Hide & Chill Bar, which has an extensive range of cocktails and a daily happy hour from 6pm-8pm, and a Sunday market which offers a three-course brunch with live jazz music. Some of the vegetables are sourced from their own garden. Breakfast is a refreshing, energizing affair with fresh fruit platters, toast and eggs, curd and muesli as well as tea/coffee. If you wish, you can sample a traditional Sri Lanka breakfast with prior notice. If you have any special dietary requirements, be sure to let the staff know. They will most definitely be able to whip something up for you. Hideaway welcomes families and children.